Prior to his conversion to Catholicism, Blessed John Henry Cardinal Newman preached in 1835 a series of Advent Sermons on the Anti-Christ. I have always found them extremely intriguing, and I am going to present them on each of the Sundays in Advent this year. As long as the world lasts, this passage of Scripture will be full of reverent interest to Christians. It is their duty ever to be watching for the advent of their LORD, to search for the signs of it in all that happens around them; and above all to keep in mind this great and awful sign which the text speaks of. At this season of the year, then, when we turn our thoughts to the coming of CHRIST, it is not out of place to review the intimations given us in Scripture concerning His precursor: this I shall now do in several Sermons; and, in doing so, I shall follow the exclusive guidance of the ancient Fathers of the Church.I follow the ancient Fathers, not as thinking that on such a subject they have the weight they possess in the instance of doctrines or ordinances. When they speak of doctrines, they speak of them as being universally held. They are witnesses to the fact of those doctrines being received, not here or there, but every where. We receive those doctrines which they thus hold, not merely because they hold them, but because they bear witness that all Christians every where then held them. We take them as honest informants, but not as a sufficient authority in themselves, though they are an authority too. If they were to state these very same doctrines, but say, “These are our opinions; we deduced them from Scripture, and they are true,” we might well doubt about receiving them at their hands. We might fairly say, that we had as much right to deduce from Scripture as they had; that deductions of Scripture were mere opinions; that if our deductions agreed with theirs, that would be a happy coincidence, and increase our confidence in them; but if they did not, it could not be helped-we must follow our own light. Doubtless no man has any right to impose his own deductions upon another, in matters of faith. There is an obvious obligation, indeed, upon the ignorant to submit to those who are better informed; and there is a fitness in the young submitting implicitly for a time to the teaching of their elders; but beyond this, one man’s opinion is not better than another’s. But this is not the state of the case as regards the primitive Fathers. They do not speak of their own private opinion; they do not say, “This is true, because we see it in Scripture” -about which there might be differences of judgments-but, “this is true, because in matter of fact it is held, and has ever been held, by all the Churches, down to our times, without interruption, ever since the Apostles:”-where the question is merely one of testimony, whether they had the means of knowing that it had been and was so held; for if it was the belief of so many and independent Churches at once, and that as if from the Apostles, doubtless it cannot but be true and Apostolic. This, I say, is the mode in which the Fathers speak as regards doctrine; but it is otherwise when they interpret prophecy. In this matter there seems to have been no Catholic, no universal, no openly declared traditions; and when they interpret, they are for the most part giving, and profess to be giving, either their own private opinions, or uncertain traditions. This is what might have been expected; for it is not ordinarily the course of Divine Providence to interpret prophecy before the event. What the Apostles disclosed concerning the future, war, for the most part disclosed by them in private, to individuals-not committed to writing, not intended for the edifying of the body of CHRIST,- and was soon lost. Thus, in a few verses after the text, St. Paul says, “Remember ye not, that when I was yet with you, I told you these things?” and he writes by hints and allusions, not speaking out. And it shows how little care was taken to discriminate and authenticate his prophetical intimations, that the Thessalonians had taken up an opinion, that he had said-what he had not said-that the Day of CHRIST was immediately at hand. Yet, though the Fathers do not convey to us the interpretation of prophecy with the same certainty as they convey doctrine, yet in proportion to their agreement, their personal character, and the general reception at the time, or the authority of the sources of the opinions they are stating, they are to be read with deference; for, to say the least, they are as likely to be right as commentators now; in some respects more so, because the interpretation of prophecy has become in these times a matter of controversy and party. And passion and prejudice have so interfered with soundness of judgment, that it is difficult to say who is to be trusted in it, or whether a private Christian may not be as good an expositor as those by whom the office has been assumed. 1. Now to turn to the passage in question, which I shall examine by arguments drawn from Scripture, without being solicitous to agree, or to say why I disagree, from modern commentators: “That Day shall not come, except there come a falling away first.” Here it is said that a certain frightful apostasy, and the appearing of the Man of sin, the son of perdition, i.e. as is commonly called, Antichrist, shall precede the coming of CHRIST. Our SAVIOUR seems to add, that it will immediately precede Him, or that His coming will follow close upon it; for, after speaking of “false prophets” and “false Christs,” “showing signs and wonders,” “iniquity abounding,” and “love waxing cold,” and the like, He adds, “When ye shall see all these things, know that it is near, even at the doors.” Again He says, “When ye shall see the abomination of desolation . . . stand in the holy place then let them that be in Judea flee into the mountains.” Indeed, St. Paul implies this also, when he says that Antichrist shall be destroyed by the brightness of CHRIST’S coming. If, then, Antichrist is to come immediately before CHRIST, and to be the sign of His coming, it is manifest that he is not come yet, but is still to be expected. Further, it appears that the time of Antichrist’s tyranny will be three years and a half, which is an additional reason for believing he is not come; for, if so he must have come quite lately, his time being altogether so short; and this we cannot say he has. Besides, there are two other attendants on his appearance, which have not been fulfilled. First, a time of unexampled trouble. “Then shall be great tribulation, such as was not from the beginning of the world to this time, no, nor ever shall be; and except those days should be shortened, there should no flesh be saved.” This has not come. Next, the preaching of the Gospel throughout the world-“And this Gospel of the kingdom shall be preached in all the world for a witness unto all nations; and then shall the end come.” Now it may be objected to this conclusion, that St. Paul says, in the passage before us, that “the mystery of iniquity doth already work,” i.e. even in his day, as if Antichrist had in fact come even then. But he would seem to mean merely this, that in his day there were shadows and forebodings, earnests and operating elements of that which was one day to come in its fullness. Just as the types of CHRIST went before CHRIST, so the shadows of Antichrist precede him. In truth, every event in this world is a type of those that follow, history proceeding forward as a circle ever enlarging. The days of the Apostles typified the last days: there were false Christs, and troubles, and the true CHRIST came in judgment to destroy the Jewish Church. 2. Now, in the next place, what is told us about Antichrist by the sacred writers? This first of all, as has been already noticed, that he embodies a certain spirit, which existed even in the days of the Apostles. “The mystery of iniquity doth already work.” “Even now there are many Antichrists.” And what that spirit is, St. John declares in a subsequent chapter. ” Every spirit that confesseth not that JESUS CHRIST is come in the flesh, is not of GOD; and this is that spirit of the Antichrist, whereof ye have heard that it should come, and even now already is it in the world.” Here we see what its doctrine is to be; but on that I shall not here enlarge. I am speaking of its working, which had begun in the days of the Apostles, and has doubtless continued ever since. Doubtless this malignant principle has been at work since from time to time, though kept under by him that “withholdeth.” Nay, for what we know, at this very time there is a fierce struggle, the spirit of Antichrist attempting to rise, and the political power in those countries which are prophetically Roman, firm and vigorous in repressing it. What that spirit is, it would be beside my purpose here to attempt to ascertain, any more than to enlarge upon its doctrine; though certainly there is at this very time, as in the days of our fathers, a fierce and lawless principle every where at work,-a spirit of rebellion against GOD and man, which the powers of government in each country can barely keep under with their greatest efforts. Whether this which we witness be that spirit of Antichrist, which is one day to be let loose, this ambitious spirit, the parent of all heresy, schism, sedition, revolution, and war,-whether this be so or not, certainly the present framework of society and government, as far as it is the representative of Roman power, would seem to be that which withholdeth, and Antichrist is that which will rise when this restraint fails. Further, that by Antichrist is meant some one person is made probable by the anticipations, which have already occurred in history, of its fulfillment in this way. Individuals have arisen actually answering in a great measure to the above descriptions; and this circumstance creates a probability, that the absolute and entire fulfillment, which is to come, will be in an individual also. The most remarkable of these shadows of the coming evil appeared before the time of the Apostles, between them and the age of Daniel, viz. the heathen king Antiochus, of whom we read in the books of Maccabees. This instance is the more to the purpose, because he is actually described, (as we suppose) by Daniel, in another part of his prophecy, in terms which seem also to belong to Antichrist, and as belonging, imply that Antiochus was what he seems to be, a type of that more fearful enemy of the Church. This Antiochus was the savage persecutor of the Jews, in their latter times, as Antichrist will be of the Christians. A few passages from the Maccabees will show you what he was. St. Paul in the text speaks of an apostasy, and of Antichrist as following upon it; thus is the future typified in the Jewish history. “In those days went there out of Israel wicked men, who persuaded many, saying, Let us go and make a covenant with the heathen that are round about us: for since we departed from them, we have had much sorrow. So this device pleased them well. Then certain of the people were so forward herein, that they went to the king, who gave them licence to do after the ordinances of the heathen; whereupon they built a place of exercise at Jerusalem according to the custom of the heathen; and made themselves uncircumcised, and forsook the holy covenant, and joined themselves to the heathen, and were sold to do mischief.” After this introduction the Enemy of truth appears. “After that Antiochus had smitten Egypt, he returned again, . . . and went up against Israel and Jerusalem with a great multitude, and entered proudly into the sanctuary, and took away the golden altar, and the candlestick of light and all the vessels thereof, and the table of the shewbread, and the pouring vessels, and the vials, and the censers of gold, and the veil, and the crowns, and the golden ornaments that were before the temple, all which he pulled off. And when he had taken all away, he went into his own land, having made a great massacre, and spoken very proudly.” After this, he set fire to Jerusalem, “and pulled down the houses and walls thereof on every side. . . . Then built they the city of David with a great and strong wall, . . . and they put therein a sinful nation, wicked men, and fortified themselves therein.” Next, “King Antiochus wrote to his whole kingdom, that all should be one people, and every one should leave his laws: so all the heathen agreed according to the commandment of the king. Yea, many also of the Israelites consented to his religion, and sacrificed unto idols, and profaned the sabbath.” After this he forced these impieties upon the Israelites. All were to be put to death who would not “profane the sabbath and festival days, and pollute the sanctuary and holy people: and set up altars, and groves, and chapels of idols, and sacrifice swine’s flesh and unclean beasts,” and “leave their children uncircumcised.” At length he set up an idol, or in the words of the history, “the Abomination of Desolation upon the altar, and builded idol altars throughout the cities of Juda on every side. . . . And when they had rent in pieces the books of the law which they found, they burnt them with fire.” It is added, “Howbeit many in Israel were fully resolved and confirmed in themselves not to eat any unclean thing, wherefore they chose rather to die . . . and there was very great wrath upon Israel.” Here we have presented to us some of the lineaments of Antichrist, who will be such, and worse than such, as Antiochus. The history of the apostate emperor Julian, who lived between 300 and 400 years after Christ, furnishes another approximation to the predicted Antichrist, and an additional reason for thinking he will be one person, not a kingdom, power, or the like. So again does the false prophet Mahomet, who propagated his imposture about 600 years after Christ came. And there have been events in our childhood, and in the generation before us, which seem to give still additional probability to the notion, that Antichrist is one, not many men acting together. What I have said upon this subject may be summed up as follows:-that the coming of Christ will be immediately preceded by a very awful and unparalleled outbreak of evil, called in the text an apostasy, a falling away, in the midst of which a certain terrible man of sin and child of perdition, the special and singular enemy of Christ, or Antichrist, will appear; that this will be when revolutions prevail, and the present framework of Society breaks to pieces; that at present the Spirit which he will embody and represent, is kept under by “the powers that be,” but that on their dissolution, he will rise out of the bosom of them, and knit them together again in his own evil way, under his own rule, to the exclusion of the Church. 4. It would be out of place to say more than this at present. I will conclude by directing your attention to one particular circumstance contained in the text, which I have already in part commented on. It is said there will “come a falling away, and the man of sin will be revealed.” In other words the man of sin is born of an apostasy, or at least comes into power through an apostasy, or is preceded by an apostasy, or would not be except for an apostasy. So says the inspired text: now observe, how remarkably the course of providence, as seen in history, has commented on his prediction. First, we have a comment in the instance of Antiochus previous to the prophecy, as I have already shown. The Israelites, or at least great numbers of them, discarded their own sacred religion, and then the enemy was allowed to come in. Next the apostate emperor Julian, who attempted to overthrow the Church by craft, and introduce paganism back again: he was preceded, nay he was nurtured, in the first great heresy which disturbed the peace and purity of the Church. About forty years before he came to the throne arose the pestilent Arian heresy which denied that CHRIST was GOD. It ate its way among the rulers of the Church like a canker, and what with the treachery of some and the mistakes of others, at one time it was all but dominant throughout Christendom. The few holy and faithful men, who witnessed for the Truth, cried out, with awe and terror at the apostasy, that Antichrist was coming. They called it the “forerunner of Antichrist.” And true, his Shadow came. Julian was educated in the bosom of Arianism by some of its principal upholders. His tutor was the Eusebius from whom its partisans took their name; and in due time he fell away to paganism, became a hater and persecutor of the Church, and was cut off before he had reigned out the brief period which will be the real Antichrist’s duration. The next great heresy, and in its consequences far more lasting and far spreading, was of twofold character,-with two heads, as I may call them, Nestorianism and Eutychianism, apparently opposed to each other, yet acting towards a common end: it in one way or other denied the truth of CHRIST’S gracious incarnation, and tended to destroy he faith of Christians not less certainly though more insidiously than the heresy of Arius. It spread through the East and through Egypt, corrupting and poisoning those Churches which had once, alas! been the most flourishing, the early abodes and the strong holds of revealed truth. Out of this heresy, or at least by means of it, the impostor Mahomet sprang, and formed his creed. Here is another especial Shadow of Antichrist. As to the third and last instance, which I might mention in the generation immediately before ourselves, I will but observe that in like manner, the Shadow of Antichrist arose out of an apostasy, an apostasy to infidel doctrines, perhaps the most flagitious and blasphemous which the world has ever seen. These instances give us this warning. Is the enemy of CHRIST, and His Church, to arise out of a certain special falling away from GOD? And is there no reason to fear that some such Apostasy is gradually preparing, gathering, hastening on in this very day? For is there not at this very time a special effort made almost all over the world, that is, every here and there, more or less, in sight or out of sight, in this or that place, but most visibly or formidably in its most civilized and powerful parts, an effort to do without religion? Is there not an opinion avowed and growing, that a nation has nothing to do with religion; that it is merely a matter for each man’s own conscience,-which is all one with saying that we may let the truth fail from the earth without trying to continue it? Is there not a vigorous and united movement in all countries to cast down the Church of Christ from power and place? Is there not a feverish and ever busy endeavour to get rid of the necessity of religion in public transactions? for example, an attempt to get rid of oaths, under a pretence that they are too sacred for affairs of common life, instead of providing that they be taken more reverently and more suitably? an attempt to educate without religion,-that is, by putting all forms of religion together, which comes to the same thing? an attempt to enforce temperance, and the virtues which flow from it, without religion, by means of societies which are built on mere principles of utility? an attempt to make expedience, and not truth the end and the rule of measures of state and the enactments of law an attempt to make numbers, and not truth, the ground of maintaining, or not maintaining this or that creed, as if we had any reason whatever in Scripture for thinking that the many will be in the right, and the few in the wrong? An attempt to deprive the Bible of its one meaning to the exclusion of others, to make people think that it may have a hundred meanings all equally good, or in other words, that it has no meaning at all, is a dead letter, and may be put aside? an attempt to supersede religion altogether, as far as it is external or objective, as far as it is displayed in ordinances, or can be expressed by written words,-to confine it to our inward feelings, and thus, considering how transient, how variable, how evanescent our feelings are, an attempt in fact, to destroy religion? Surely, there is at this day a confederacy of evil, marshalling its hosts from all parts of the world, organizing itself, taking its measures, enclosing the Church of CHRIST as in a net, and preparing the way for a general apostasy from it. Whether this very apostasy is to give birth to Antichrist, or whether he is still to be delayed, we cannot know; but at any rate this apostasy, and all its tokens, and instruments, are of the Evil One and saviour of death. Far be it from any of us to be of those simple ones, who are taken in that snare which is circling around us! Far be it from us to be seduced with the fair promises in which Satan is sure to hide his poison! Do you think he is so unskillful in his craft, as to ask you openly and plainly to join him in his warfare against the Truth? No; he offers you baits to tempt you. He promises you civil liberty; he promises you equality; he promises you trade and wealth; he promises you a remission of taxes; he promises you reform. This is the way in which he conceals from you the kind of work to which he is putting you; he tempts you to rail against your rulers and superiors; he does so himself, and induces you to imitate him; or he promises you illumination,-he offers you knowledge, science, philosophy, enlargement of mind. He scoffs at times gone by; he scoffs at every institution which reveres them. He prompts you what to say, and then listens to you, and praises you, and encourages you. He bids you mount aloft. He shows you how to become as gods. Then he laughs and jokes with you, and gets intimate with you; he takes your hand, and gets his fingers between yours, and grasps them, and then you are his. Shall we Christians, sons of GOD, brethren of CHRIST, heirs of glory, shall we allow ourselves to have lot or part in this matter? Shall we even with our little finger help on the Mystery of iniquity which is travailing for birth, and convulsing the earth with its pangs? “Oh my soul come not thou into their secret; unto their assembly, mine honour, be not thou united.” “What fellowship hath righteousness with unrighteousness? and what communion hath light with darkness? And what concord hath CHRIST with Belial? or what part hath he that believeth with an infidel? and what agreement hath the temple of GOD with idols? for ye are the temple of the living GOD. Wherefore come out from among them and be ye separate . . . and touch not the unclean thing,” lest you be workers together with GOD’S enemies, and be opening the way for the Man of sin, the son of perdition. Probably the best Church historian to write in English. I believe some of his best work was his monographs: the learning condensed into “The Trials of Theodoret” is astonishing. With his passion for the real, he always concentrates on individuals and actions, rather than notions, of which he had a low opinion. 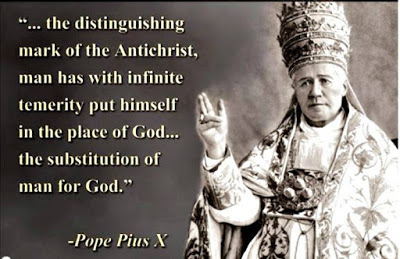 Amen to St. Pope Pius X’s comments.